It is very easy to get caught up in the frenzied, accelerated pace of business as we’ve come to know it. We all have those moments when we wish we could stop the action, catch our breath, and hit the pause button. The good news is ? you can! If the business you have started is struggling, your immediate response may be to generate more activity and quickly try a list of new things. I’m asking you to pause, quit trying to run forward, and take a step back. Take some time to plan? The steps to set up business, industry, market, product, competition and pricing research? Identify your strengths and start your business with those strengths in mind? Consider how you to position yourself with those strengths in mind? Do a personal budget to see how much money you need to live on? Did you plan to keep working while you are building your new business? Did you get a part-time job to supplement your income while you are getting started? Plan realistic revenue targets in your new business, taking into consideration that you are starting from scratch and it will take time for your business to build? Do you have a sense of what your expenses will be and budget for them? This is just a short list of things to consider as you hit pause. That time to reflect and focus gives you a chance to see what you may have missed during start-up. If you didn’t consider each of these questions, you can still do it now — it is not too late! 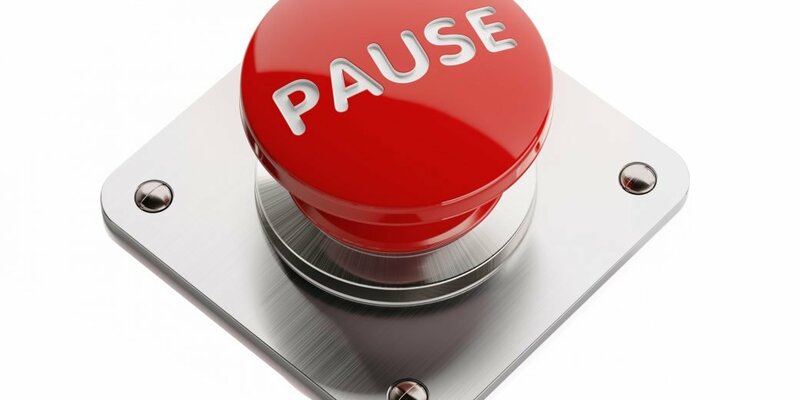 Leverage your “pause” to reset the path of your business. It’s not too late. You can still regroup, make plans, establish targets, and reset your business. Remember that it is YOUR business. You are responsible for you! Remember, all it takes to get yourself back on track is your willingness to pause, reflect and reset.